Would you like to feed your spirit–the deepest part of yourself–and feel refreshed, renewed, and closer to God than ever? 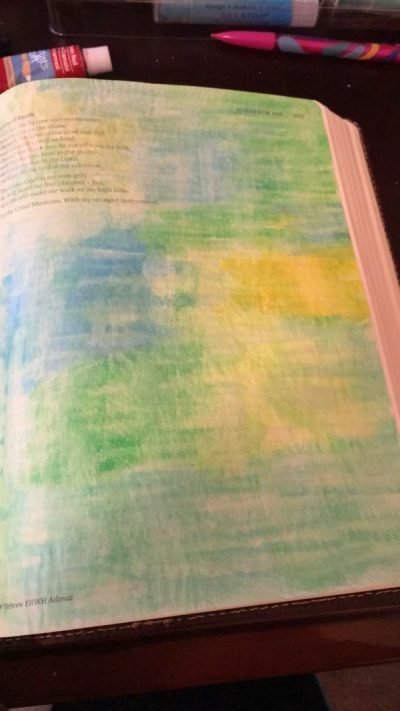 If so, Bible journaling with color and art may help you like it has helped me. This is the first of my series about how to start Bible journaling; read on for my story! Until recently, the concept of coloring and drawing in my Bible seemed foreign to me. I didn’t understand how or why anyone would want to do that. But then I was asked to teach a class on this kind of Bible journaling at my local church, and everything changed. 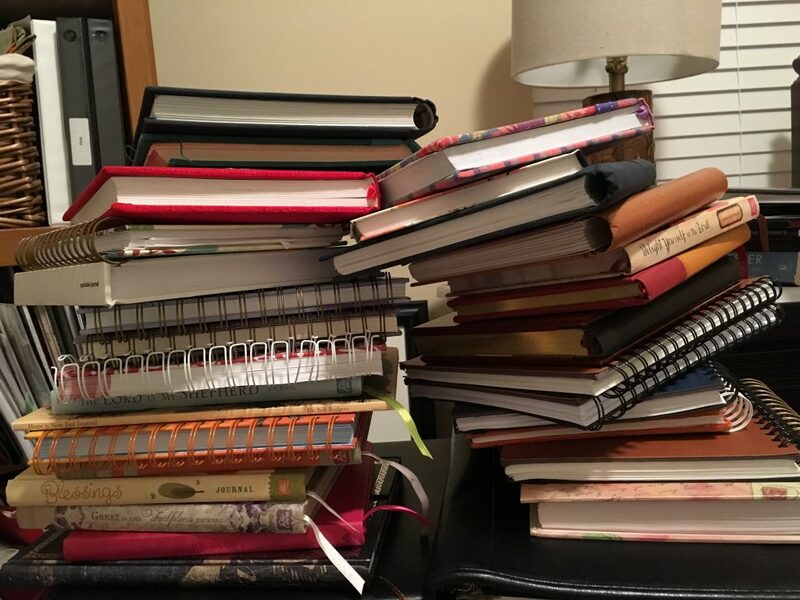 I do know how to just-plain-journal; I have kept regular, paper journals for years, and never plan to stop. Journaling in a paper journal has made a HUGE (seriously monumental) difference in my walk with God. A giant stack of most, but not all, of the journals I’ve filled up since I got saved. These books chronicle my walk with God, record ideas, contain study notes, prayers, and more. 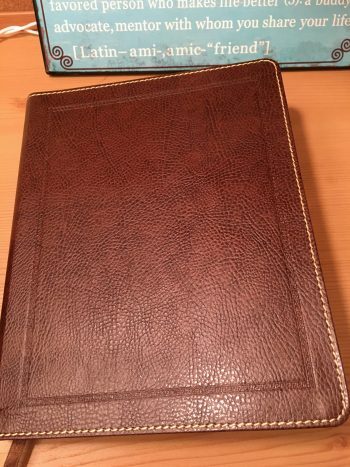 I started using a regular journal right after I got saved. Nobody told me to do this except Holy Spirit. And it has been one of the BEST things I’ve ever done. I wouldn’t give it up for anything. But I didn’t know how to put art or color in my Bible, or why you would call that “journaling.” After all, “journaling” requires the use of a journal, right? I didn’t know how powerful it would be. I didn’t know how it would bless my soul. Most of all, I didn’t realize how Bible journaling with art and color could feed my spirit. Sooo much time in God’s Word. Sooo much time in prayer. But it has been hard work, this feeding of my spirit. And many times, it has felt tedious and not. nearly. enough. So I got asked to teach this class, right? And one of the main things I do with my time is to serve at my church, so of course I said yes. But … that meant I had to learn how to do this kind of Bible journaling, and quickly! Bible journaling blesses, enlarges, and feeds your spirit. 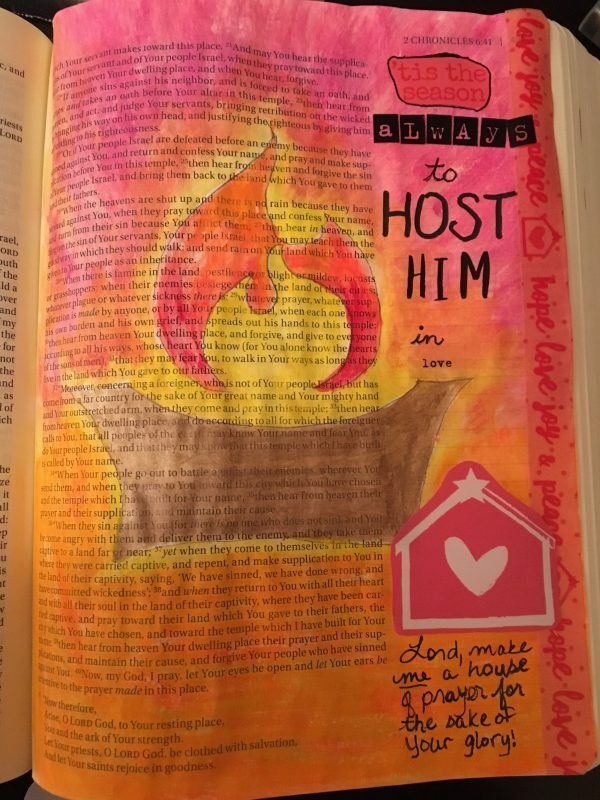 I shouldn’t be surprised that Bible journaling with art and color has such an impact. People have been doing this since at least medieval times. However, in recent centuries, the Church lost its art. I fully believe that God Himself is birthing this Bible journaling movement in modern times because He is restoring something that the enemy stole from the Church. God is restoring art to the Church. And when we add art and color to our Bible study, we open our spirit up to receive spiritual rain from Heaven. 1. Holy Spirit speaks in the language of pictures and colors. The majority of the Bible consists of God telling stories–stories with vivid pictures, like screenplays. And when He’s not playing you a virtual movie from His ancient storyboard, He’s speaking in dreams and visions–which are PICTURES! The last passage of Habakkuk 3. All I did was color this page, and it’s still sticking with me. YET I will praise the Lord! The Bible is also full of color. God cares about color! Think of how He told Moses to build the tabernacle. He was very particular about every color. This thing was to be dyed blue and the other crimson. The furniture had to be gold, etc. Think also of the descriptions of Heaven in the book of Revelation. What color is the rainbow around God’s throne? Green! And somehow, this is important enough to God that He had to put it in His final Scriptural declaration to His people. Can you imagine that? Here’s God, telling John about the end of all things–and He tells Him to make sure to tell the world about His green rainbow! I never thought of these things until recently, but now I see them as increasingly important. So here’s the deal: pictures and color are the language of the spirit. They are the language of Holy Spirit Himself, and they are the language that YOUR spirit understands. 2. When you add color and pictures to your Bible (regardless of whether you can draw or not; stickers are fine), all of a sudden your spirit engages. Your spirit was made to be the dwelling place of Holy Spirit. Your spirit is what makes you you. When your spirit dies, you die–but your life does not depend on your mind, will, or emotions. So when the deepest part of you feels dry, it’s your SPIRIT that needs to be fed. When you start to feed your spirit using its own language–the language of pictures and colors from Heaven–it’s like turning the key in the ignition of your spirit. All of a sudden, your spirit roars to life. And the deepest part of you–the part that has been starved and, in many cases, possibly even withered down to nearly nothing–comes alive. You can feel this coming-to-life. I’ve experienced this feeding of my spirit for myself in massive ways recently. My spirit has been so parched. I’ve been trying to do all the extra things I mentioned above to get fed. The most helpful thing I’ve found recently has been to spend as much time as possible in worship and praise. That has definitely helped. But something has still been missing. And when I began coloring in my Bible during my worship and praise, as part of my worship and praise, I found the missing ingredient. Use coupon code SHINEHISLIGHT and get $20 off a $60 order at DaySpring through December 31, 2016. 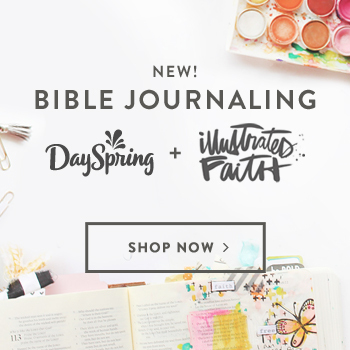 Their Illustrated Faith line of Bible journaling products is amazing! A few days ago, I woke up at like 3 AM on a Saturday morning, bolt upright. I mean, I was WIDE awake, no going back to sleep possible. I’ve learned that when I wake up at 3 AM or any other unreasonable time :), it’s because God is calling. So after a few minutes, I got up. However, instead of going into my study to actually study, I felt led to go into my creative room where I have my art supplies. When I did, I put some praise music on YouTube and sat down with my journaling Bible. A Scripture came to mind that really spoke to some things I was dealing with. I opened to that page and began to draw an image that I saw in my spirit when I woke up. As I drew in my Bible, I felt Holy Spirit begin to minister to me. It was like He took the watering can of His refreshing rain and began to pour it into my spirit into deep places that I could not even access. I felt Him feeding my spirit, enlarging it and helping my spirit man (woman) to breathe deeply again. I’m seriously beginning to weep as I’m even writing this story for you. As I drew on the page of this Scripture, the revelation of the Biblical truth from that Scripture brooded in my spirit. And by the time I was done, I HAD IT. I mean, I really got it. “It” was a Scripture that addressed the hard times I had been going through, and I really received its comfort and truth deep down in my heart and spirit as I simply drew it. And when I finished the coloring, I was so overwhelmed by and caught up in God’s glory that I laid on my face, worship music still going, and wept and shook with great wracking, healing sobs before the Lord. Because He did it. He fed me. He healed and comforted my heart. All because I submitted to His favorite and highest language–that of His Word with pictures and colors. 3. 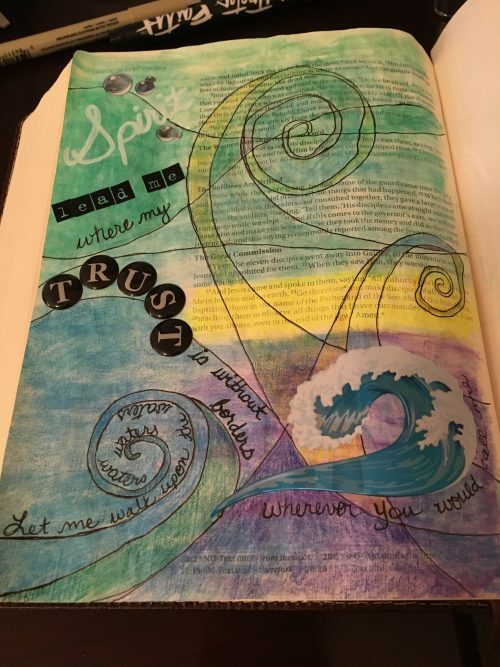 Bible journaling with art and color engages both your left and right brain. The left side of your brain handles your logical, analytic thinking. The right side of your brain is the creative, artistic, imaginative side. When you study your Bible and it’s just words–even if Holy Spirit is ministering the words to you–your left brain is processing the thoughts. And that’s great! THEN, all of a sudden, both your left brain and right brain stand up and pay attention to God’s Word! His Word comes alive, because ALL of you suddenly is participating in the experience–not just half of your brain. When your full brain kicks in, your brain stands ready to cooperate with your spirit. I want God to arise to His resting place–Him and the ark of His strength. And I want to be that resting place. Lord, make me a house of prayer. Washi tape and stickers are from the Illustrated Faith ‘Tis the Season Bible journaling kit, available from DaySpring November 18. Your brain is completely in operational mode and comes into agreement with what your spirit is doing, engaging and receiving from Holy Spirit Himself. … and my emotions still. My anxieties vanish away. Peace and rest fill my heart as I bow in the Presence and love of my Father. We have a good, good Father. Those are the three reasons why Bible journaling (using color and art) makes your spirit roar to life. I hope you’re ready to get started. Tomorrow, I’ll talk about my favorite tools to use for Bible journaling. (Yes, I’ll be posting a lot more than usual this week.) Stay tuned! Have you ever done Bible journaling with color and art before? Or if not, would you like to try it? Please leave a comment below and tell me your thoughts! 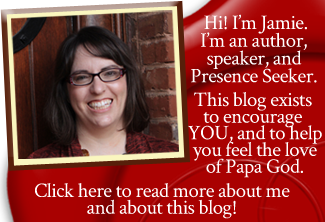 Thank you Jamie for blogging about Bible Journaling! This new series will definitely stir up people to get into the Bible! This is definitely a huge blessing! I often hear people say they don’t understand what’s being said and sadly the Word of God lies on a shelf to collect dust. This series will create passion and interest because of engaging both the left and right brain. The best part is God will honor the effort given. Oh Hallelujah! I’m excited as well for the increased creativity and the increased passion it will bring to my life and I love the Word of God! Thank you Jamie! Great job tapping into a valuable resource! It’s so fun, LaShondra. And it makes a tremendous difference in how much you get out of your Bible study–and how much Scripture you remember. I have colored with children for years and now adults. There is a great series of Jesus videos from Nest Entertainment, my mother purchased years ago for our daycare. They were donated to a church, but I have a Master Copy of their coloring books. If He can use coloring for children, He certainly can for adults, I’ve seen it help tremendously. And I was taught you shouldn’t write in a Bible by some. And truthfully, I never let children abuse books. Not that everyone shares my passion for them. I would suggest it for anyone who can do it, to go for it. If you can start a group or visit nursing homes. Pinterest is loaded with ideas, and there is an NIV coloring Bible, I hope to give as gifts. Hi Jamie, Thank you very much for sharing this very special experience with us and share Holy Spirit inspired ideas with us on how to enjoy the Word of God in a creative way. After all we are Daddy God Almighty’s children and I love colouring. Really inspirational message. I’m definitely going to make use of it. Thank you once again and God bless you. Thanks for reading, Carlo. I pray that Bible journaling with art and color will bless you tremendously! This was such a great post! Thank you for sharing! Thank you! Thanks for reading; I’m so glad it blessed you! WOW … what a GREAT article, thanks for sharing. I’ve been into art journaling for around 3 years and it has saved me and I tell God ALL the time it is my love letters to Him and for Him. I ordered a journaling Bible and it is my Christmas present from me to me, but just leery about actually doing it. This article is perfect for where I am and that “push” to just do it! Thank you!! Go for it, Kimberly! And feel free to share some pictures when you do, if you’d like to! I have always been into creative drawing zentangling and art in general. I am new to bible journaling. This article really spoke to my spirit. It was empowering and encouraging. Thank you for obeying the Lord. This is so needed. Cannot wait to get the free toolkit. Again thanks.